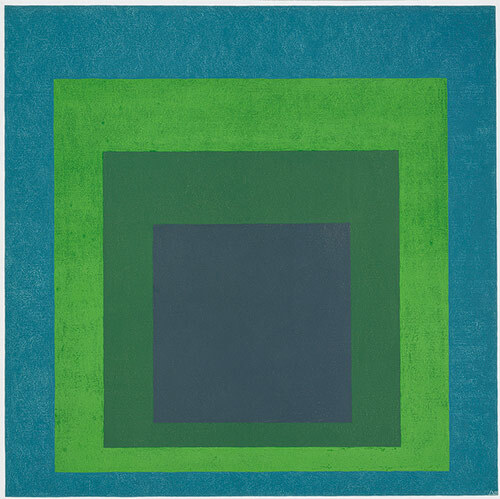 Josef Albers was born in Germany in 1888 but spent most of his life in America where he died in 1976. There is plenty of biographical information available about him so no need to repeat that here. There seem to be two main legacies of Albers work that he is remember for – his Homage to the Square series and the book “Interaction of Colour”. Homage to the Square was a series of over 1,000 paintings all focussed on the form of the square but exploring the impacts of different colours when applied to that simple geometric shape and how those colours can trick the eye. By concentrating on a simple shape, Albers created different optical effects through the use of colour and approached his work in the manner of scientific experiment, recording the pigments used carefully on the back of each painting. The photo below shows Homage to the Square: Soft Spoken. Paintings were created by applying the colour directly from the tube onto masonite board and spreading colours with a palette knife; a very rough way of working for such exact scientific experiments. 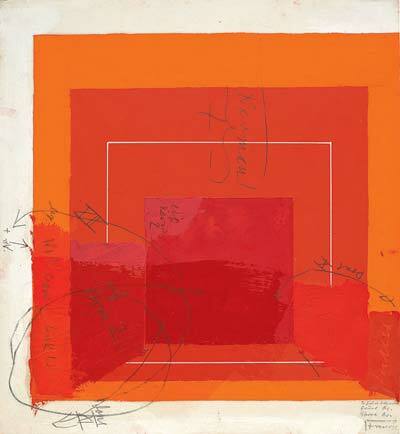 It is interesting to see Albers preparatory studies, such as the one below titled Color Study for White Line Square, oil on blotting paper with gouache, pencil and varnish. This study seems to me to have much more life and vitality to it, it has movement in the pencil markings and is more vibrant than the finished, straight edged squares. 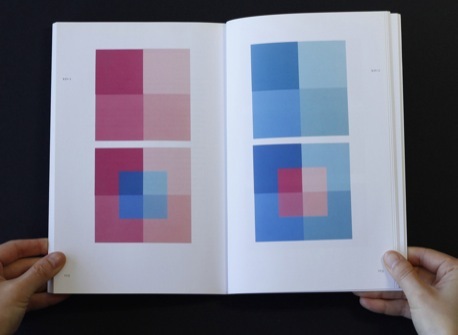 Josef Albers book Interaction of Colour is a respected colour theory text book. I contacted the State Library of Western Australia to see if I could borrow a copy and was surprised to find they do not keep it. Looking at the information I could find online I can now see where the exercises on colour that were done in Assignment 2 fit in, with the squares withing squares and seeing the difference the surrounding colour makes on the central colour and vice versa. Some of the key items covered in the book are that there is no substitute for experience and practice for understanding colour; that people’s visual memory for colour is weak and that people have strong colour preferences and associations. Aside from the Homage to the Square series and his book, Josef Albers produced some other interesting work especially in his earlier days at the Bauhaus where he specialised in glass, first as a student and later as a teacher. 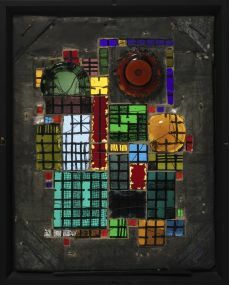 I particularly like his work Shards in a Picture Grid which is a stained glass window style piece in an abstract style. I like this because of the basic geometric shapes that interrupt and break each other to randomise the design. It also mixed colours, with some bright, clear patches and others than seem dull and muted so there are contradictions within the work. 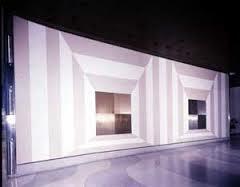 Geometric shapes continued to play a strong role in Albers work, as well as Homage to the Square he produced designs for architectural sculpture such as Two Portals in bronze and glass which is at the Time and Life building. From looking at the work of Josef Albers it has made me realise that there really aren’t limitations to designs that can be developed from a sketchbook – after all if he could produce 1000 painting based on squares then I should be able to do a handful from a single image! It reminds me of the work of Henry Moore who kept a sketchbook purely of the sheep he could see from his window and sketched them constantly for a period of a few months, capturing them in every stage of growing and through all weathers. My mind seems to be so full of ideas that I find it hard to imagine dedicating that much time to an idea or theme; maybe that is why I haven’t got a personal style as I don’t follow any one idea through enough to develop a style.